Arven built with latest technologies for photographers, photo studio, agency and creative websites. Arven comes with ready 150+ pre-built pages. Functional many galleries, albums, collections, inner pages and modules for your website needs. 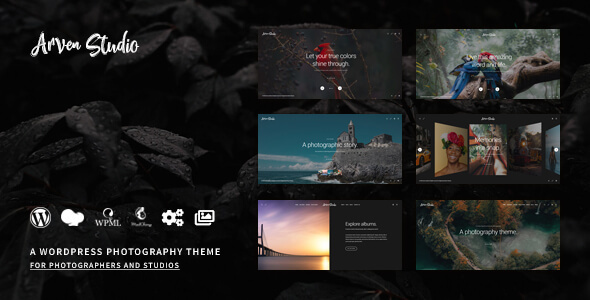 Customize the theme with your dreams via advanced theme customizer and build your creative websites. Useful 1000+ modules, elements and customizer settings. Create creative galleries more than 500 style alternatives. Easy to use, useful, pure and visual. Homepages, galleries, collections, albums, pages, and more. Ready 150+ pre-built pages for create your creative websites. Media Support: Audio, Spotify, SoundCloud etc.